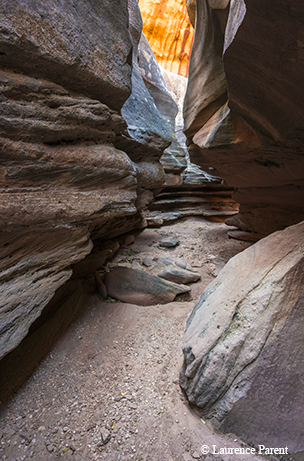 Exploring the park's hidden corners reveals wild slot canyons and hoodoos. At sunrise on a cold December day, we set off on a quest to find one of the little-known treasures of Palo Duro Canyon — a series of narrow slot canyons — somewhere deep in the backcountry of the state park. After stepping out of our cars, our guide Bary Nusz leads us straight up the side of a 600-foot mesa covered in loose rocks. We struggle to gain our footing — suffering from an inefficient two-steps-forward-one-step-back method of ascent. In little time, we’re scared, scraped up and gasping for breath. Bary calmly waits for us to catch up. Why isn’t he breathing hard? As we’ll come to find out, he’s full of surprises, and so are the canyons and mesas we’ve come to explore. 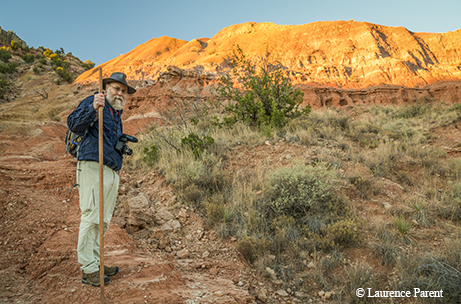 Thankfully, Bary and Palo Duro Canyon are willing to share their secrets. Bary Nusz likes exploring the hidden corners of Palo Duro. Most people who visit Palo Duro Canyon State Park take in the big views, pitch a tent, watch the musical Texas and head down the trail to the Lighthouse, the park’s signature formation. That’s what I had done in my visits to the park. But those who are willing to further explore the park will find that it contains slot canyons, box canyons, caves, big boulders, hoodoos, scenic mesa tops, giant junipers and other natural and cultural wonders. That’s what we’ve come to explore — the lesser-known side of Palo Duro. I’m joined by photographer Laurence Parent and a few friends: Jim MacKay and Peter and Elizabeth Comer. Laurence is a super-hiker, Jim is a hard-core bike commuter and the Comers are ultra-marathoners. Bary, though, with his black leather hat, Santa Claus beard, extra-tall hiking pole and gleam in his eye, is the only one who seems to have expended no energy on our ascent up this mesa. The narrow canyons, called slot canyons, we hope to visit are similar to those found in remote areas of northern Arizona and southern Utah. The Palo Duro slots have been visited by very few people because of the difficulty in reaching them. Once on top of the mesa, we hike across a vast, almost featureless expanse, populated by grasses, cactuses and mesquites. Finally, a side canyon reveals itself. How Bary got here is a wonder of navigation. As we work our way down a creekbed, we get a glimpse of the first slot — a long, deep gash in the Trujillo sandstone layer of the park. Water has carved this deep, sinuous canyon only a couple of feet wide and 20 feet deep. We climb down into it, able to touch both sides of the canyon walls at the same time. Slot canyon at Palo Duro. Amazing patterns of reflected light change the undulating canyon walls from purple to gray to orange. We ooh and ahh and wow our way through the narrow hallway of rock, pausing often to take in as much as we can of this natural wonder. Downstream from the first slot is a second slot. Approached from the bottom, it envelops us in a rock corridor created by time and water. Sunlight filtering in from the lower portion of the slot creates a warm glow. 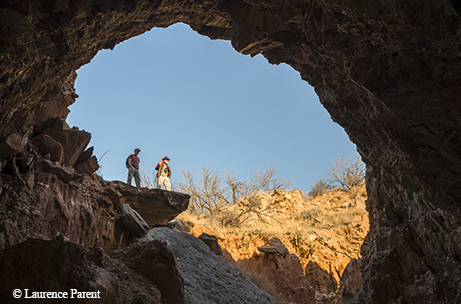 This is the first destination in our treks to the hidden treasures of Palo Duro, and we’ve already hit the jackpot. After returning to the main part of the park, Bary suggests a visit to Red Star Ridge, a hoodoo about a mile’s hike down a trail. Red Star’s capstone protects the softer mudstone beneath it, forming a pillar. These pillars, or hoodoos, are scattered throughout Palo Duro. Red Star, perched on a ridge, proves to be an exceptionally nice one, enhanced by the presence of a miniature version of itself nearby. Bary, a Renaissance man from nearby Amarillo who offered to show us around the park, loves remote places and extreme nature. He’s a tornado chaser, with a hail-pockmarked car full of camera mounts to record twisters and big thunderstorms. He’s a software developer, creating programs to count cattle in feedlots using his drone. Bary’s a backcountry hiker and photographer. He’s also a fencing instructor. Palo Duro Canyon is one of his special places. People have lived in the canyon, the second largest in the U.S., for 12,000 years. The rocks tell an older story, representing a time span of 240 million years. In more recent centuries, the canyon was a stronghold for the Apache, Kiowa and Comanche tribes. When the Native Americans were gone, rancher Charles Goodnight and his longhorn cattle moved in. The State of Texas bought land for a state park in 1933, and the federal Civilian Conservation Corps came in to build cabins, trails and the park road. The National Park Service considered Palo Duro for national park status, envisioning it and the surrounding territory as a “National Park of the Plains,” but land acquisition proved troublesome. Palo Duro Canyon State Park occupied 16,000 acres for much of its existence. Since the turn of the 21st century, however, the acquisitions of the Cañoncita and Harrell Ranch properties have increased the park’s area to 28,000 acres. The new territory protects the site of the 1874 Battle of Palo Duro Canyon, an event of great importance in Texas history. It also incorporates a big chunk of North Cita Canyon and part of South Cita Canyon — dramatic offshoots of Palo Duro Canyon — and provides a route to access them, something the park had been missing. The state park system hopes to eventually open public access to those canyons, and when it does, they are destined to be some of the premier backcountry destinations in Texas state parks. 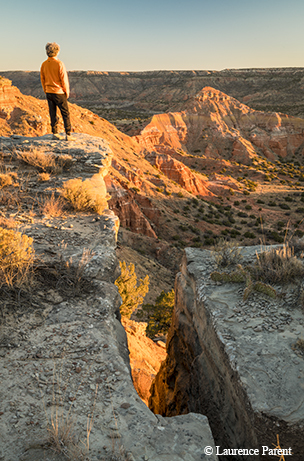 Visit tpwd.texas.gov/palodurocanyon for information on trails and safe hiking. 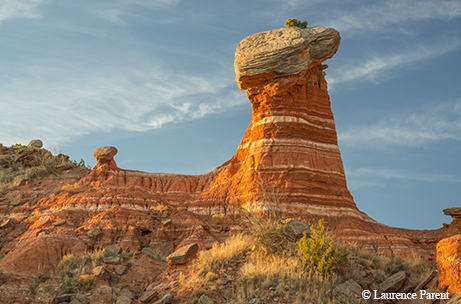 Palo Duro Canyon stands out as the most striking, spectacular and unexpected feature of the Panhandle. “There are so many beautiful areas here — you just have to get out and walk to them,” Erik Buzzard says as we hike up to Sorenson Peak, a prominent outcrop of rock high above the Hackberry Campground, on our second day in the park. Trail runners Buzzard and Phillip Schmidt and mountain biker Chris Podzemny have joined us for the day’s explorations. The morning’s itinerary involves a hike up Sorenson Peak, a walk over to a slot in an adjacent canyon and then a descent down the Burnt Draw creekbed. As always, some surprises are in store along the way. We huff and puff our way to the top of Sorenson Peak, able to see our breath in the frosty air of the morning. From the top of Sorenson, the rising sun illuminates the vast canyon below and brings out its vivid colors — the deep reds of the Quartermaster layer, the yellows and lavenders of the Tecovas formation and the reddish-gray of the Trujillo and Ogallala formations. This morning’s sunrise certainly lives up to that. After taking in the view, we hike over to a small slot canyon carved in the rock at the top of Burnt Draw. It’s not as deep or extensive as the slots from the previous day, but it’s still an interesting geological feature. It ends abruptly into a pour-off chute into the canyon below that makes a dramatic 50-foot waterfall when it rains. On the canyon floor below, we come across a grove of Rocky Mountain junipers, soaring dozens of feet into the air with trunks several feet thick. These are the trees that give Palo Duro (“hard wood”) its name. Trees this big — a rarity in an arid land of mesquites and grasses — indicate a regular source of water, and we find water frozen into ice in shallow puddles. We spend several minutes walking down the creekbed before we encounter an unexpected development. The creek disappears into a cave. Chris has gone ahead of us, and we hear his voice echoing out from darkness inside. A cave entrance frames hikers at a spot where the creekbed in Burnt Draw suddenly goes underground. Luckily, I have my headlamp with me, so we decide, with a little nervousness, to see where the cave takes us. After ducking our heads to enter, we find we can stand in the cave with no problem, and we walk the 50 feet to the exit, where we have to crawl to get out the small opening. Well, that was fun! We reach a point where the creekbed crosses Comanche Trail, and Chris points out some of his handiwork on this rediscovered old CCC trail on the eastern side of the park. Runners and mountain bikers have been the driving forces in creating an extensive trail network that provides some of the best mountain biking in the state. Chris decides to take us to a little-known rock etching left by CCC workers 80 years ago. Just a stone’s throw from one of the park’s main campgrounds, on a band of rock about 20 feet off the ground, CCC workers inscribed “U.S. VETERANS, 1934” in block letters into the sandstone, marking the year Palo Duro became a state park. We’ve already seen a lot, and the day is still young. We next hike out to a set of pictographs and mortar holes left by Native Americans — a reminder of the long, rich history of Native American habitation of the canyon. Apache, Comanche and Kiowa tribes used the canyon’s bountiful resources to thrive here for centuries. The Red River War ended that. The 1874 Battle of Palo Duro Canyon, which occurred just south of us on what is now park property, proved to be the decisive battle. The Native Americans fled up this very canyon, Tub Springs Draw, haunted by the desperate realization that their way of life, the freedom of the plains, was coming to an end. 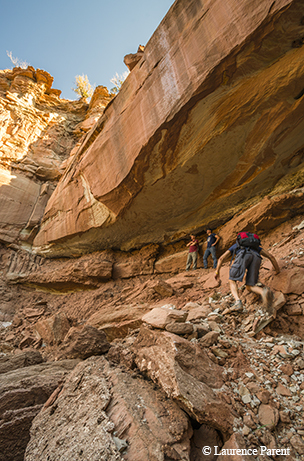 Hikers reach the overhang found at the head of Red Canyon. Our next destination is Red Canyon, a little-visited canyon next to Red Mesa. Bary has told us there’s a double box canyon at the end — one box canyon above another at the head of the canyon. Our hike — hopping from rock to rock, glopping through sections of mud and listening to Chris regale us with Palo Duro tales of guns, gold and murder — brings us to a seeming dead end. The steep red rock walls of the box canyon enclose us on three sides, marking the head of the canyon. If there’s another part of the canyon above this, we can’t see it. Chris decides to find a way up and around, and he reports the existence of a grotto-like canyon above the portion of the canyon we’re in. Intrigued, we follow him up to stare down into the improbable hole, accessible only to birds and the most agile of climbing creatures. We had heard about some interesting-looking fissures at the top of Capitol Mesa, and from the top of Sorenson Peak, we saw that the area got good morning light. On our third day, we decide to hike to the top of the mesa for sunrise. Once on top of the mesa, we walk out to a prominent point where big chunks of incised sandstone create a series of tunnels and fractures. They’re not exactly slot canyons, but the rock hallways offer enjoyable exploration. We work our way through, over and around the fissures as the sun peeks over the horizon. Some of the large cracks are angled just right so the sun comes shining through, bouncing off the walls. Nearby Capitol Peak glows with reds, yellows, oranges and lavenders. Jim points out how a landslide of the loose Tecovas layer on Capitol Peak has spilled down to cover the Quartermaster layer below, mixing millions of years of geologic time. “There’s a lot of geology going on here,” he says. Standing atop Capitol Mesa (top photo), Jim MacKay soaks up the view of Capitol Peak. 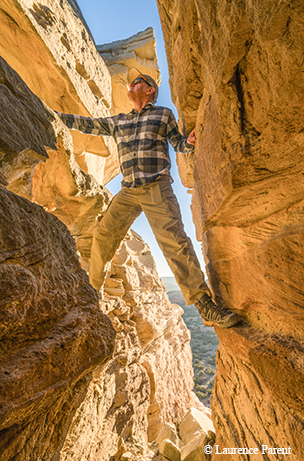 Author Russell Roe (bottom photo) explores a fissure on Capitol Mesa. The afternoon brings us to what we think will be one of the biggest challenges of our trip — North Spur Draw. The prize is a small slot canyon at the head of the canyon. The problem, as we have noticed from afar, is that the cliff band at the head of the canyon appears to be really steep. We start our hike up a creekbed but somehow end up in the wrong draw. We decide to go up and over a cactus-filled ridge to get back to the right place. As we get closer, the cliff band at the head of the canyon looks no less steep. We find a weathered rope hanging down the cliff face, placed there by some enterprising adventurer. We’re wary. The rocks crumble in our hands, making any type of climbing a dangerous venture. Using the rope without knowing how it’s attached at the top seems foolhardy. “I like old ropes even less than I like loose rock,” Jim says. Laurence and I pull on the rope as hard as we can, but the chances of us venturing up this cliff are dwindling to zero. It will have to remain The Slot Canyon That Got Away. For now. Our final night in the park coincides with the peak of the Geminid meteor shower. Jim and I are both Geminis, and we lie in the bed of our pickup like twins, watching meteors streak across the sky — an amazing sight to conclude a trip full of amazing sights.